Menasina saaru or pepper cumin rasam is very tasty and healthy saaru for winter season and also for nursing mothers. Pepper helps in increasing the milk production in nursing mother. 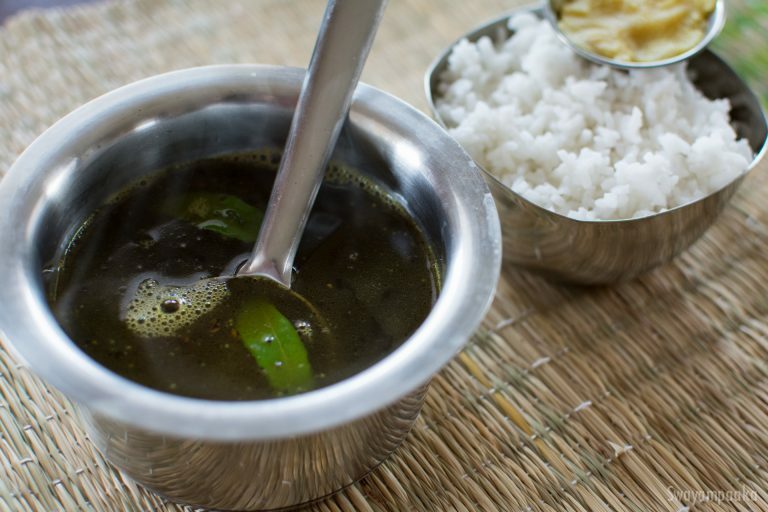 This rasam is soothing and gentle on stomach. After the delivery of the baby the woman's body goes through a lots of hormonal changes. It is always good to have simple, healthy food and calm environment for the recovery. If you feel the rasam is spicy you can add hot milk at the end and serve it to the new mother. If it not for new moms you can add coconut milk too. You can squeeze lemon juice and drink hot rasam/saaru. Heat a drop or 2 ghee in a ladle, fry pepper and cumin seeds for few seconds and turn off the heat. Crush this using mortar and pestle and keep it ready. Boil 1 cup of water in a pan along with salt, curry leaves, and jaggery. To the boiling water add the crushed powder, and allow it to boil for 4 to 5 minutes on medium low heat and turn off the heat. Serve this hot to new mother with hot rice and ghee.